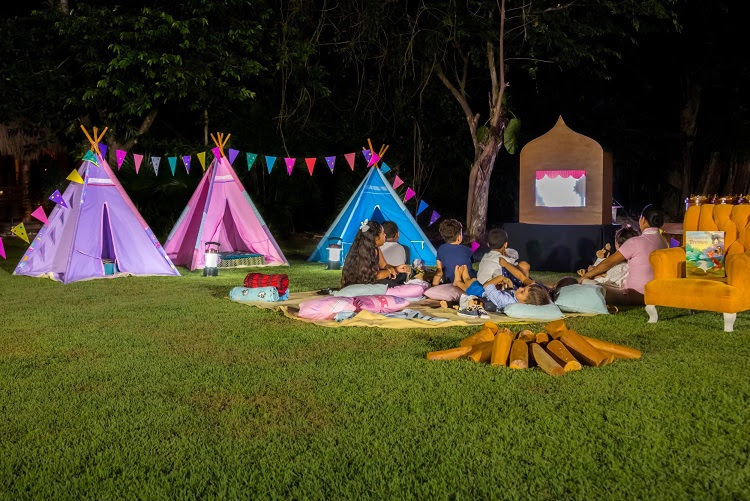 Riviera Maya, Mexico (January 14, 2019) - Grand Velas Riviera Maya is offering a new glamping activity for kids. A popular trend among adults, glamping is a fusion of glamour and camping perfect for those wanting to explore the outdoors while keeping some of today's modern comforts. Now kids can get in on the fun. A highlight of the activity, kids can fancy up s'mores with gold marshmallows and several flavors of gourmet chocolate. Additionally, kids will have fun sitting by the campfire, making glammed up dreamcatchers, telling stories, creating puppet and shadow theater shows, and playing games like musical chairs and hide-and-seek. Kids can opt to overnight in their own individual teepee tent with luxe bedding and blankets. The Kids' Glamping activity is included in the resort's nightly rate. Resort rates start at $434 USD. Rates are per person per night based on double occupancy and include à la carte gourmet meals at a variety of specialty restaurants, luxury suite accommodations, premium branded beverages, 24-hour in-suite service, fitness center, taxes, gratuity and more. For reservations or additional information, call 1-888-407-4869, or visit https://rivieramaya.grandvelas.com. 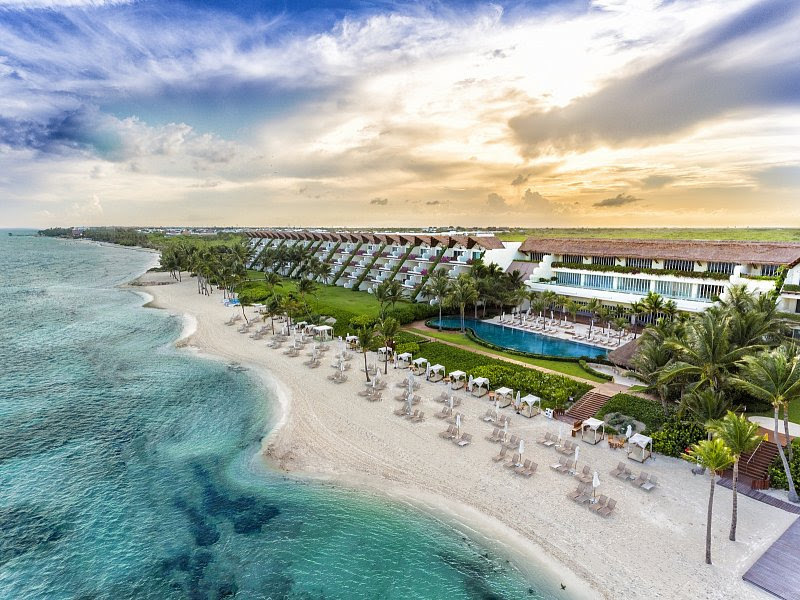 The AAA Five Diamond Grand Velas Riviera Maya is an ultra-luxury all-inclusive resort set on 206 acres of pristine jungle and mangroves and with the finest white sand beach in the Riviera Maya. Guests can choose accommodations among oceanfront, ocean view and a Zen-like tropical setting, embraced by the flora and fauna of the Yucatan Peninsula's jungle. All 539 designer-like suites are exceptionally spacious, more than 1,100 square feet each, all with balconies, and some with private plunge pools. All feature fully stocked mini bars, L'Occitane amenities, artisanal mezcal, and Nespresso coffee machines. Bathrooms deserve special mention with walk in glass shower, deep soaking Jacuzzi tubs and marble interior. Eight restaurants, including five gourmet offerings, present a tour through Mexico, Europe and Asia. Cocina de Autor, at the hands of world-renowned celebrity chefs Bruno Oteiza and Mikel Alonso, holds the AAA Five Diamond Award, the first all-inclusive restaurant in the world to win this prestigious distinction. Se Spa is the region's largest spa sanctuary at more than 90,000 square feet, known for its authentic Mexican treatments, offerings from around world and signature seven-step water journey. Other features include 24-hour Personal Concierge; 24/7 in-suite service; three swimming pools; two fitness centers; water sports; innovative Kids' Clubs and Teens' Club; baby concierge; Karaoke Bar; Koi Bar; Piano Bar, and business center. The resort offers more than 91,000 square feet of meeting space and outdoor areas for events inclusive of a 31,000-square-foot Convention Center, able to accommodate up to 2,700 guests. The resort has won numerous awards from Travel + Leisure, Conde Nast Traveler, USA Today and several other magazines and major companies worldwide, including Virtuoso's Best Spa and TripAdvisor's Hall of Fame. A member of the Virtuoso Hotels & Resorts Program, Grand Velas Riviera Maya was built and is operated by Eduardo Vela Ruiz, founder and president of Velas Resorts, with brother Juan Vela, vice president of Velas Resorts, by his side. For reservations or additional information, call 1-888-407-4869, or visit https://rivieramaya.grandvelas.com/.